Challenge: For student to create and design a individualized unique iPad stand and storage, with a Unicorn theme for a gift for a younger student. Background: The student involved in this design is a nine year old student. She has shown considerable talent and design in a wide range of projects. As part of this process she created an original design with a 'Unicorn' featured on the front left hand side. This unicorn was sourced from a Tinkercad search of freely available and then Incorporated into the design. The lettering was added in a second print - initially the first design had a regular lettering that was the same colour as the main print. The student felt that it would improve the presentation of the print to change the colour and to alter the font, this was done and the name was replaced with orange filament and then super glued onto place on the print. The Unicorn was included as part of the main print, conceivably this could have been altered or printed in a separate colour. This design is another that we would consider a exemplar of an outstanding design of a project that numerous students have created variations of. Design in use not storage at back. Level of Difficulty: High - the design while it may appear slightly simplistic has considerable depth to it. The Unicorn in conjunction with the other aspects of the print, the bar at the front, the storage at the back were all aspects that needed to work and interact with each other. Time frame: Twenty hours. The lettering that featured on the front was an additional forty minutes. Given all the dimensions and aspects of the print this would be the minimum required - removing the Unicorn (which serves little real purpose) would reduce the print time to eighteen hours or so. This would be consistent with some of the best prints in this series, which have come in within the sixteen to twenty two hour mark. Given all factors that can be considered this time consideration was appropriate for the design. Size: The Unicorn had a height of 70mm. The base of the front of the design was 100mm and featured a block that was 10mm by 10mm. The base was 70mm long. The base at the back formed a rectangular storage area for work materials (see above photograph). Given the purpose of this print the size was excellent for the intended purpose. What we would do differently: The Unicorn at the front as it was set back from the print formed a barrier for the iPad when placed on the stand. This rendered the bar created for this purpose as obsolete. We could have placed the Unicorn at a different point on the design, but having it protrude too far out the design could also have been problematic. Next Steps for Students: This is an exemplar the student needs to move onto other challenging projects. Challenge: For student to create a new and improved iPad stand with significant storage and to minimise the amount of PLA used for printing. Background: The student who designed this had input from a number of other students in the classroom who had completed similar projects. The student concerned wanted to learn from others and produce a project that would minimise the PLA required to complete the project, but also allow an iPad stand to be created, that would also allow the storage of considerable materials and stationary. In addition to this a strong personalisation would occur of the design which was created by the student featuring his name prominently in the design. The student completed this design and did so in exceptional circumstances - there was some slight Tinkering prior to completion. He changed his name to include a capital letter and it was centered more. He also reorientated the design to include more of it centred in the middle. Level of Difficulty: High - to complete this print with the dimensions that were produced with minimum PLA used is extremely difficult. This student has a proven flair for design with what is essentially his first large scale project. He has had input from other students however the project and dimensions were extremely successful. Timeframe: Seventeen hours - while those of you who are not familiar with 3D Printing might think that this timeframe is excessive given the scale of the project however earlier versions of this type of print have been anywhere to five hours on top of this. Given the dimensions and detail this is an exceptional use of PLA to complete the project. Size: The main block that forms the base of the design was 100mm across and 170mm long. The base was 20mm thick or wide. The 'Bailey' lettering was 70mm in height. The storage container that is behind the middle point of the print measured an additional 75mm from teh base. As it was designed for storage the inside was hollow. Generally the width of the print was 3mm which would be the minimum required for the strength of the sides. Nothing from this would be changed in hindsight. What we would do differnently: This was an exceptionally designed and created print. Given all of the factors related to this print no changes would be made. This is going to be an example used to show others what is possible. Next Steps for students: The lid of the storage container was dropped down to allow for the creation of a lid to go ontop of the design. This would allow the storage to be sealed. Above: Full design shown in profile. Challenge: Student wanted to independently produce a combination iPad stand and storage unit that could be created as a first project independently. Background: This student was developing the idea of 3D Printing having seen numerous examples in the classroom. She was not a student who had previously worked on a project. The student is nine years old. The shapes with the design were straightforward given that she was looking to produce something original that was workable. On discussion with the teacher the student made the decision to include their name across the lip of the iPad stand. Again it was a basic lettering task from the main Tinkercad interface which was very straightforward and allowed the student to easily produce it. Level of Difficulty: Medium - the dimensions of the design needed to work to complete the process. Time frame: Nineteen hours. Given the combination of storage at the back of the iPad stand (which for stationary as shown is considerable) and the stand at the front this would be an excellent use of time. The standard default settings of a 20% infill with the printer running a 8mm nozzle. Size: The print consisted of two main pieces. You had the rectangular design at the front for the iPad stand, this was 120mm across and and had a 20mm rectangular block. The block at the back was 10mm thick and rose 130mm. The lettering for the name was two mm from this base. The final part of the design was the circular stationary holder at the back. This had a basic circle shape and was 110mm high. What we would do differently: Minimal the student was extremely thrilled with the result and as a consequence didn't want to revise or change anything. The print was robust and workable. Next steps for student: Having successfully completed the task without any revision required the student needs to challenge themselves to move onto other projects. Challenge: This is an updated version of the previous post. This was the revised changes that were suggested at the end of the details of the previous print. Background: The previous print had the name of the person on the reverse of the base (adjusted). There was also the storage issue - in the original, while the intention had been for the storage to be featured in the interior of the design, this had not been completed prior to the final print. The second print in this series shows this clearly. Level of Difficulty: Low/medium - first attempted 3D Print by the student (who is ten years old). Using Tinkercad and the basic design features the project was completed (including revisions) within thirty minutes. Size: 70mm by 70mm by 70mm. What we would do differently/Next steps for students: The only issue here is the overall size of the project. As a storage container the current project on the current size is limited to what it can hold - which includes regular pens and pencils. The students have completed the project and will now move onto other projects. 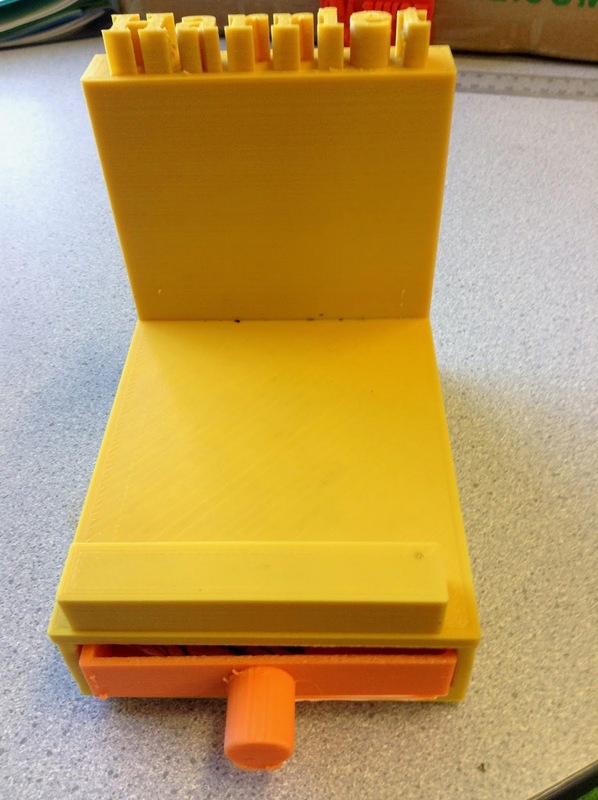 Challenge: To create an original Star Wars themed desk utility holder suitable for a student or adult to use in the classroom to store stationary items. Background: This was a new student to our schools first project to complete using a 3D Printer. The student had experience with design and wanted to create something in line with his interest in Star Wars - hence the use of the Death Star as the significant feature of the design. As it was the first project from this student and we were prepared to give him some leeway with his design ideas - this was his first project, as stated and it was created by a ten year old. The intention was to produce a 'Death Star' model using a precreated model, place it on a base, include a name on the base and then modify the original to have a design purpose - in this instance it was intended that there be space in the top for miscellaneous small items. This project was intended as a prototype to produce a bigger version and also to demonstrate a practical use for a 3D Printer to someone who hadn't created a project before. The dimensions of the print were reflected in the nature of the prototype. Level of Difficulty - Low/Medium. This project is straightforward with the major design component coming from a precreated freely available model. The additional aspects from the student were to add and personalize features by basic designs from the main Tinkercad Interface. The project to put in perspective had no teacher input other than printing the final project. Time frame: Five hours - as a prototype this design was using all standard Ultimaker2+/Cura designs and default settings. Given that this was a test, that essentially turned into the finished product because the students were so happy with it, the design time frame/dimensions wouldn't be altered. The option would be needed if the consideration was given for storage for pens/pencils and the students therefore would need to upscale the design scale/time frame to meet these requirements. Size: Essentially the design as it stands at teh moment is 70mm by 70mm by 70mm. The base plate is minimal and the name produced on the base of the design - as mentioned the concept of increasing the design dependant on its use. What we would do differently: The name of the student the project that was produced for was on the reverse of the design (assuming the view shown above is the front). The storage at the top of the design was left off this prototype, to ensure that the printer would be able to produce the shape of the Death Star successfully. 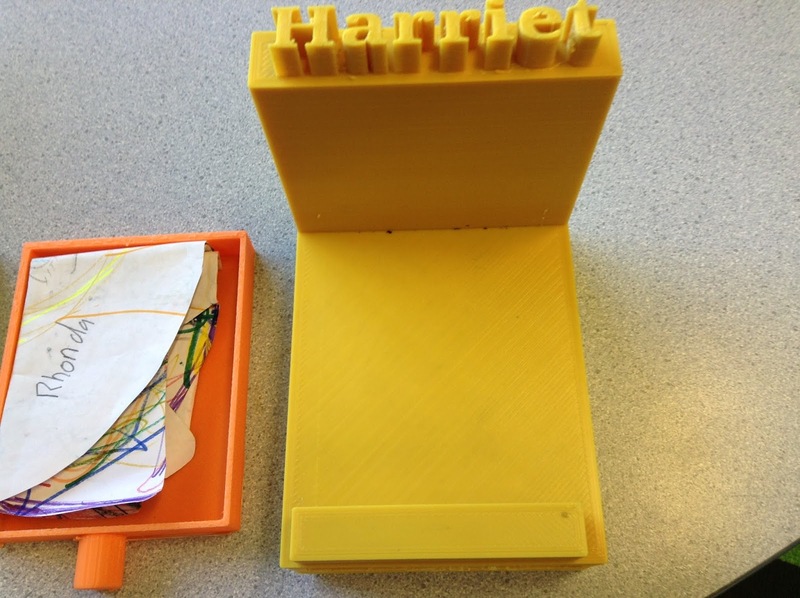 This is a fantastic starting project for a student taking his or her first steps related to 3D Printing. Next Steps for Students: To complete the project by making minor adjustments. The student is intending to adjust the above issues and then will move onto new projects. Project Overview: Over the course of the last week the student in charge of the classroom has been working to produce individual lettering for each classroom in the school. This process has been detailed in the previous post on this blog. Each of the featured numbers followed a similar design process, that is they were created using the basic Tinkercad Interface and had holes introduced into the design to allow mounting onto a wire fence. We had the process of design and we were looking at a practical task - to ensure that our classrooms at school had a marked location which was easily recognizable in which to assemble outside for Fire drills. We also are going to be testing the ability of the 3D Printed PLA Designs to withstand the outside environment - to check for weathering, damage etc. How could it apply to you in the classroom: Individualise you classroom badge or numbering on a school wide basis. You could colour code your numbers or even look at using glow-in-the-dark filament for affect (although having said that would you be present at the classroom during darkness). You could also personalise a door with lettering and instructions (such as do not enter without a teacher, when door is closed filming is in progress etc).